Off Season Bride: Is "No Chicken Nuggets in the Bathroom" Too Much To Ask? Is "No Chicken Nuggets in the Bathroom" Too Much To Ask? So, I posted some of the pictures of me trying on pretty dresses. Now the ugly truth: that particular day, I had possibly the least special-bridey-romantic-pretty moment of this whole process so far. After trying on the first 50 six dresses, I had to use the loo, so I excused myself and made my way to the ladies' room. I walked in, locked the door behind me, and immediately gasped aloud at the filth. 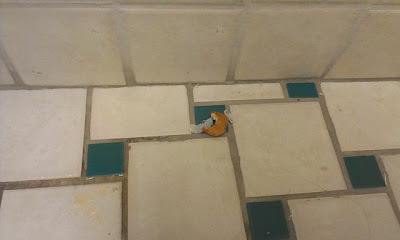 In addition to pee-stains (EWWWW) and random clumps of toilet paper clinging wetly in the corners (GROOOSSSS), THERE WERE HALF-EATEN CHICKEN NUGGETS STREWN ABOUT THE FLOOR. Can you see the pee? And the nugget? And some toilet paper bits? In one shot, I tried to capture as much of the environment as possible. I wanted to run screaming from this gross room, crying out a warning to everyone else: "They keep saying words like special and beautiful bride and magic and organza fantasy BUT IT'S A SHAM, THERE ARE CHICKEN NUGGETS IN THE CRAPPER!" ... which is when I learned that the lock to the door did not work, because without so much as a courtesy knock (WHEN DID PEOPLE STOP COURTESY KNOCKING?!) some stranger barged right into the room and stared at me on the toilet. Then her eyes drifted down to the chicken nuggets, and she continued staring WITH THE FREAKIN' DOOR OPEN, until I said "Please close the door!" I felt violated, disgusting, disgusted, and decidedly non beautiful-bride-y. Come on, bridal shop. Step it up! Is "no chicken nuggets in the bathroom" (okay, and no strangers watching me pee) really too much to ask? I was there. Thus I believe it.